After 25 years working as an architect, Thom Dixon was ready for something new. He also knew he didn't want to go to work for someone else. Having a friend who was in the parking lot sweeping business in nearby South Carolina, Dixon went to check out his operation and liked what he saw. One of his next steps was to do an internet search, Dixon says, which brought him to a number of articles written by me. Then, as Dixon reminded me during our interview, he contacted me to get some advice. "I was determined to go at this in the right way, to find out all I could about the business from people who really had that information. You were very helpful in getting me going in the right direction and you also referred me to speak to (veteran contractors) Gale Holsman and Gabe Vitale. They gave me good advice, as well." Following instructions, Dixon contacted a number of property managers in the area to see if they were 100% satisfied with the job the current sweeping contractors were doing. What he learned was there appeared to be a niche in the market for someone who would be dedicated to quality. "There were a number of local contractors," said Dixon, "but they were 'in the ditch' of seeing how low a price they could offer in order to get work. Then, there would be no way they could do a quality job for the customer. What I learned in talking to property managers was there was a need for someone who would really keep a shopping center looking its best. That sounded good to me and we've been growing in that niche ever since." His due diligence seemed to show that he'd be fine if he chose either a TYMCO or a Schwarze sweeper as his first unit. Since there was a TYMCO dealer nearby, he went there for a test drive and ended up with a TYMCO 210, a sweeper he still has in operation today. "Although the 210 is a fine sweeper, since then I've gone primarily to Nite-Hawk sweepers," relates Dixon. "I like the diesel cabovers, because they're so maneuverable, and the fact they cost less to operate since they have just one engine. 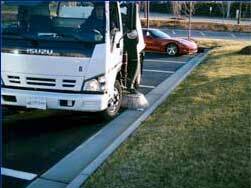 We also have a Schwarze A4000 that we use for some highway sweeping and heavier cleanup needs. We've stayed out of construction sweeping, though, since construction clients usually need immediate service and we feel that would be disruptive to our other scheduling." After he got his sweeper, Dixon returned to the property managers who had encouraged him to get into the business and had an excellent response from them. It wasn't long before he was facing the challenge of making sure the quality he promised was the quality the clients expected. The company's growth in that regard speaks for itself. "I'm proud to say, we've lost less than a handful of customers in our years of operation and none due to some type of service issue. Since we started in 2000 we've gone from one to 13 sweepers. Currently, at the start of 2012, we have 34 full-time employees and over 100 customers. 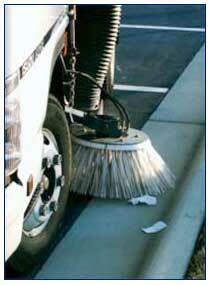 "Carolina Sweepers' clients have learned they can absolutely count on the job our guys do. The managers we work for are proud of their properties and the way our service team keeps them looking. "Our slogan, which is a quote by Benjamin Franklin, is a part of our entire business operation. We take it to heart with everything we do." Precisely because of the level of sweeping quality customers experienced, requests came in for performance of other exterior maintenance tasks. Dixon made the decision to add a number of these to his company's repertoire; others, he decided to sub out to specialist contractors in the area. "We take on a variety of different types of work," said Dixon. "We started with pressure washing, and early on I got a good deal on a high-lift truck. That provided the company with a variety of options. It paid for itself in the first three or four years, and we probably use it about three times a week. That's throughout the year, not counting the holiday season when we're very busy putting up decorations. Then, it's not long before they need to all come down again." During the non-holiday season, the bucket truck is used for changing out lights, putting up banners – even on occasion for putting insurance appraisers or other dignitaries onto client property roofs. It's a versatile, cost-effective machine that most sweeping contractors find handy – and profitable – to have in their fleet. The other services Carolina Sweepers self-performs include on-call porter services, sign and bollard repair and replacement, tenant cleanouts, showing of tenant properties, filling property condition checklists and more. However, they don't self-perform striping, sealcoating or pothole repair, all items that feature prominently on their list of services. "We have developed relationships with contractors who do those jobs for us," said Dixon. "We won't do anything ourselves that we aren't 100% great at. When we interface the jobs with these particular sub-contractors, our customers invariably get a first-rate job, we are able to make the profit we need to perform oversight and our client gets a great job at a reasonable rate. It's a win-win for all concerned. "What we have learned is that because we are the purchaser of a large amount of striping, a large amount of concrete and asphalt work, a large amount of painting, we are able to get volume discounts because we're such good customers of theirs. Plus, Carolina Sweeper clients are at the top of the list when it comes to emergency needs or customer service. "For example, I just learned via email that a customer wants a failing asphalt area repaired as soon as possible. All of the contractors in the area who do that type of work are scheduled two-to-three weeks out. Our contractor, though, just confirmed he will get the repair done for us within the next three business days. That's good business for everyone." The arrangement Dixon outlines is one that works well in most market areas. Essentially, Carolina Sweepers purchases at a wholesale rate, which allows them to assign an employee as a quality control person over the job. The company makes money, which they earn by overseeing each job. Because of the volume they provide, Carolina Sweeping is a large-scale customer for these contractors – in some cases their largest. The result for their clients is a good job every time and, as another bonus, the client still pays only the market rate and, in some cases, even less. On the audio podcast with Dixon, he discusses what he calls the "must have and nice to have" qualities he looks for when choosing a contractor. One of the most critical criteria, he says, is that they'll do a good enough job to "...not bruise my name. Their performance is a reflection on me, so I can't have them over-promising and under-delivering." Dixon says the company relies on Craigslist to find about 90% of its employees these days. He has found the quality of applicant to be better than back when they put ads into the local paper. Since the company is located on a busy highway, they also have a sign that says "third shift workers needed" that they put out when they know an opening is coming up. They also review employment applications on a weekly basis and, if someone catches their eye, they'll call them in for an interview. When there are more applications than needed, and a weeding out process is needed, one successful screening technique they've used is to hand the candidate a page out of a coloring book, along with some crayons. They then ask them to color the page. You will probably be surprised at why this is done and what is gained; I'll leave the answer for those who listen to the audio interview, which includes that information and much more. 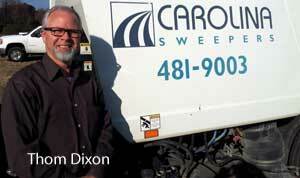 Dixon chooses to have both a sweeper operator and a backpack blower operator on his routes. Although in the podcast he details a number of reasons why that makes good common and financial sense, the basics are safety and overall cost savings. Plus, his teams are under orders that if an unsafe condition exists, they are to not get out of the truck. Whatever it takes, the lot will get taken care of the next day instead of risking anyone's safety. On a related topic, Dixon says Carolina Sweepers' mandate to all workers is they are to never be on a cell phone while the sweeper is in any gear other than 'park.' The new safety findings and federal guidelines didn't affect them at all, says Dixon, because they have long had the rule of no talking while operating a vehicle. During the attached audio podcast, Thom Dixon offers more than 50 minutes of solid, sensible advice of interest to anyone who operates a parking area sweeping company. Especially if you're thinking about offering more services, this is definitely a 'don't miss' audio. Dixon provides an excellent outline of how he works with sub-contractors in his area, as well as discusses the services they have decided to pursue as self-performing, and why. Note: The audio podcast with Thom Dixon, which is approximately 50 minutes in length, will play without downloading any files onto your computer. If you hear the interview at 'chipmunk speed,' you will need to download the latest version of Adobe's free Flash player. Thom Dixon may be reached via the company's website, which is located at www.CarolinaSweepers.com.